Brighten your day with colours that perfectly match your exterior décor and garden. Daytek Australia is proud to offer an extensive range of colours to complement and add value to Australian homes and gardens of all styles and sizes. In fact, we offer the largest range of colours for clotheslines in Australia. Daytek Australia's colours include hues from a standard modern palette, as well as special custom-ordered colours to match your garden or home. 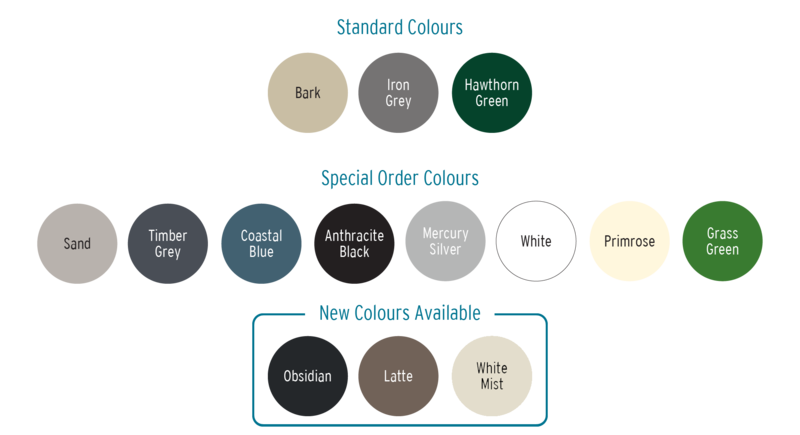 We can offer special colours because we make these units to order at our Victorian-based manufacturing facility which has its own state-of-the-art powdercoating facility. Check out each product to find out its colour options. Daytek Australia is able to provide a range of custom solutions for Daytek Australia Rotary and Fold-Down Clotheslines. Custom solutions include changes to sizes and colours, to fit special applications. Contact our customer service department for advice on how to best tailor a solution for your specific needs. Note: Colours display differently on computer monitors and therefore these colour swatches are just a guide and the final product may vary slightly. Custom orders take 14 business days for Australian orders and 4 weeks for New Zealand Orders.